Pre-cast interceptor is delivered as a one piece unit. Individual access lids to each compartment for cleanout. Three compartments separate water from any insoluble liquid or solids having a specific gravity less than that of water. Unit must be vented in regulation with plumbing codes. 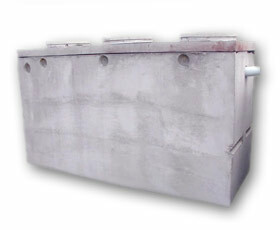 Tanks are cast with 35 MPA strength concrete at 7 days with 5-7% air. Interceptors are used to prevent oil waste from entering the sanitary sewer system. 150mm (6”) flow through pipes extends 600mm down. Outlet baffle consists of 150mm (6”) Tee and 150mm (6”) pipe (710mm (28”) in length) that is readily adaptable for filter.